The first section of chapter seven of the author's Victorian Types, Victorian Shadows; Biblical Typology in Victorian Literature, Art, and Thought, which Routledge & Kegan Paul published in 1980 and reissued in 2015. The author, who retains copyright, first created a web version in 1998, which he reformatted in in 2007 and again in 2015. 1. Henry Melville, "The Death of Moses," Sermons (London, 1836), II, 185. Succeeding quotations are taken from pp. 186-87). What says the Scripture? "As many as are led by the Spirit of God, they are the sons of God ." (Rom . viii . 14 . ) . . . It is the Spirit who leads them to Sinai and first shows them the law, that their hearts may be broken. It is He who leads them to Calvary, and shows them the cross, that their hearts may be bound up and healed. It is He who leads them to Pisgah, and gives them distant views of the promised land, that their hearts may be cheered. — John Charles Ryle, "Are You an Heir?" Faith is the Christian's Pisgah. Here he stands Enthroned above the world; and with the eye Of full belief looks through the smiling sky Into the Future, where the Sacred Lands Of Promise . . . are brought nigh, And he beholds their beauty. — Charles Sangster (182-93, known as the "Father of Canadian Poetry"), "Faith"
And Moses went up from the plains of Moab unto the mountain of Nebo, to the top of Pisgah, that is over against Jericho . And the Lord shewed him all the land of Gilead, unto Dan. Since Moses's vision of the Promised Land takes place in a complex situation marked by punishment and reward, success and failure, it is fraught with many potential ironies that authors can either suppress or develop. Like other portions of the Exodus narrative which Victorians applied as types to their own deepest personal and political concerns, the Pisgah sight appears in orthodox christological, extended religious, and completely secularized forms. Its particular significance for the student of Victorian culture lies in the fact that it possesses a complex structure, each of the parts of which can be employed for a different intonation of the basic type. God shows Moses the Promised Land. Julius Schnorr von Carolsfeld. From The Bible in Pictures. Click on image to enlarge it. The Pisgah sight is a coming together, a confrontation, of the human and the divine, the temporal and the eternal, that occurs immediately before the death of the prophet who had given his life to serving God and His chosen people. Therefore it stands simultaneously as the culmination, reward, and punishment for the acts of that life. As the Lord explains to Moses when instructing him to climb the mountain of vision, "Because ye trespassed against me among the children of Israel at the waters of Meribah-Kadesh, in the wilderness of Zin; because ye sanctified me not in the midst of the children of Israel. Yet thou shalt see the land before thee; but thou shalt not go thither unto the land which I give the children of Israel" (Deut. 32:51-2). Like the Rabbis, Christian interpreters explained God's apparently harsh punishment as His means of emphasizing that no man, no matter how powerful or blessed, can ever be above the law of God. Furthermore, Christian exegetes discovered a complex reference to Christ in this divine action. "Why, after bringing the people out of Egypt, might he not settle them in Canaan?" asked Henry Melvill. "Why, except that Moses was but the representative of the law, and that the law, of itself, can never lead us into heavenly places? The law is as "a schoolmaster, to bring us unto Christ"; it may discipline us during our wanderings in the wilderness; but if, when we reach the Jordan, there were no Joshua, no Jesus — for the names are the same to undertake to be our guide, we could never go over, and possess that good land. "111111 Melvill also argues that God punished Moses as a way of underlining that his earlier action in defying God's instructions and striking the rock a second time was wrong. The first time Moses struck the rock in Horeb and produced water for the wandering Israelites, his action symbolized the fact that law had to strike — crucify — Christ to bring forth the waters of grace and salvation. 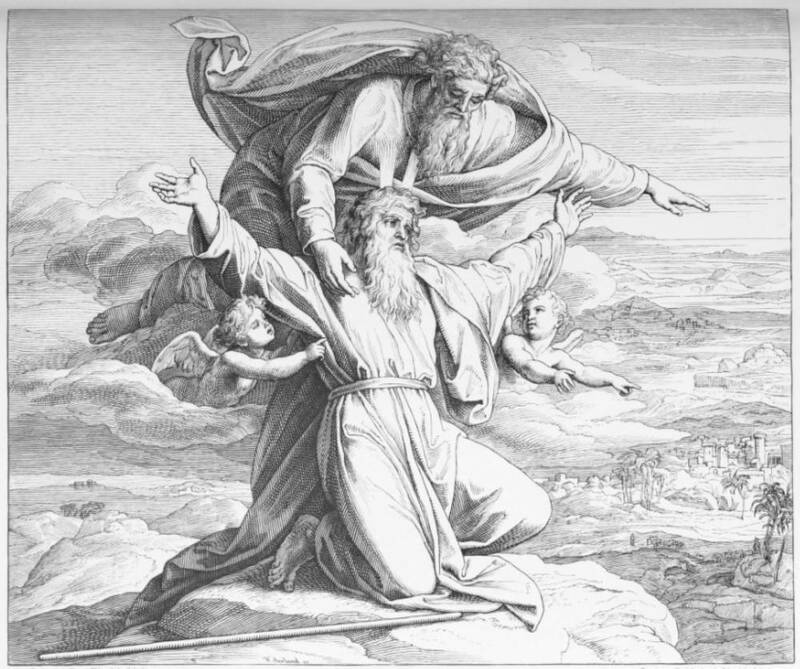 Thereafter only prayer was necessary, but by becoming impatient and striking the rock, Moses threatened to muddle the divine scheme of salvation and obscure the complex web of significant events God intended to adumbrate it. In addition, says Melvill, since Moses later appears during the transfiguration of Jesus, it was necessary to the prophet's later symbolical value that he should not enter the Promised Land in life. According to Melvill, then, Moses's dying vision on Mt Pisgah serves as a divinely intended prefiguration of the kind of Christian death so frequently urged by Evangelical preachers, tract writers, and poets, for Mt Pisgah stands as a type of the deathbed of the true believer who leaves this life confident in his faith, and Moses's sight from that mountain prefigures the Christian's dying sight of his Saviour . Unlike Melvill, who takes the rather extreme position of assuming that Moses was granted literal visions of the Christian future, this hymn takes Canaan itself in its commonplace acceptation as a type of heaven. Similarly, Isaac Watts's "There is a land of pure delight" (1709) used the parallel between the Promised Land of Israelites and Christians as a basis for making the Pisgah sight a type of the Christian's happy death. Describing the land of pure delight which awaits all believers, Watts explains that "Death, like a narrow sea, divides" it from us and that "timorous mortals" fear to attempt its waters. Opens through the shades of death. These lines, which remind us that the biblical type of the vision from Mt Pisgah can exchange values with the secular prospect or view from a high place, explain part of the complexity of this particular typological image.